Was the word "adorable" invented for this fragile little creature? 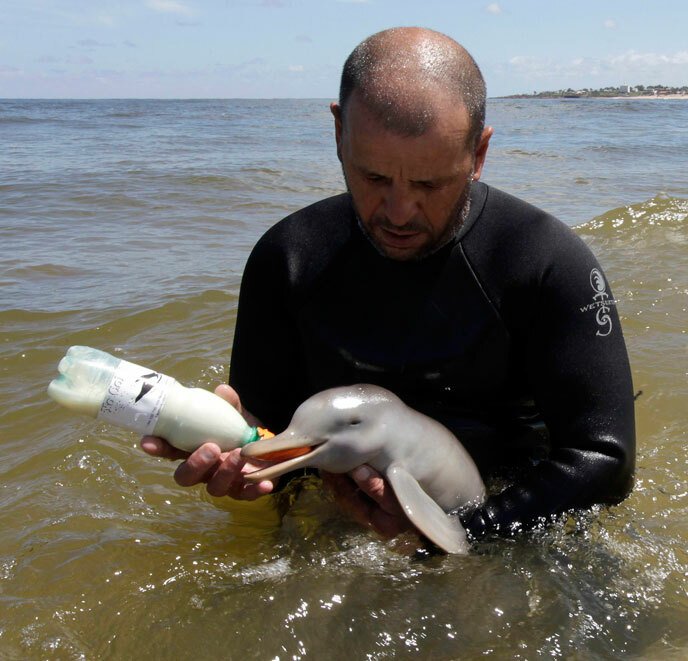 This newborn dolphin, who belongs to the rare La Plata species, which lives in South America's Atlantic coastal waters, was found tangled in a fishing net on the beach in Uruguay. She still had her umbilical cord attached, indicating that she had only just been born. 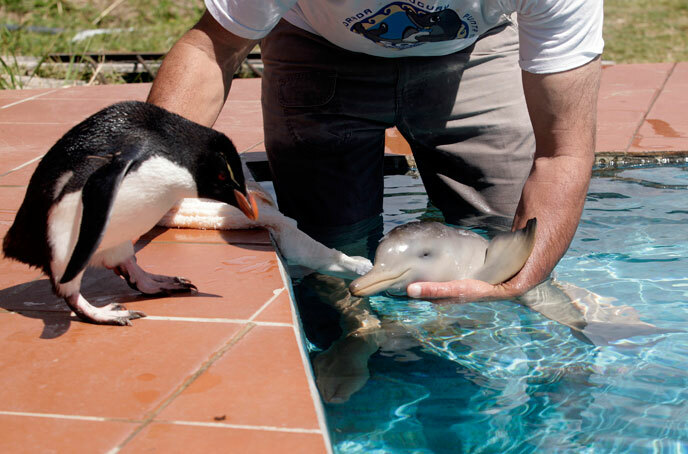 She was brought by beachgoers who discovered her to the SOS Rescate de Fauna Marina rehabilitation centre, where she is being nursed to health by Richard Tesore, the centre's director. In the image above, Richard can be seen feeding milk to Nipper, as she came to be known, through a bottle (in the wild, calves nurse from their mothers for around eighteen months). Alongside Nipper, a baby penguin was also caught in the fishing net. The penguin is also being looked after by the rescue centre. Richard takes Nipper for daily swimming lessons in the pool, and, when Richard carries her down to the ocean, Nipper can even catch small waves. As you can see from the below video showing Richard teaching Nipper to swim in the pool, Richard and the staff at the rescue centre handle Nipper with the greatest care. 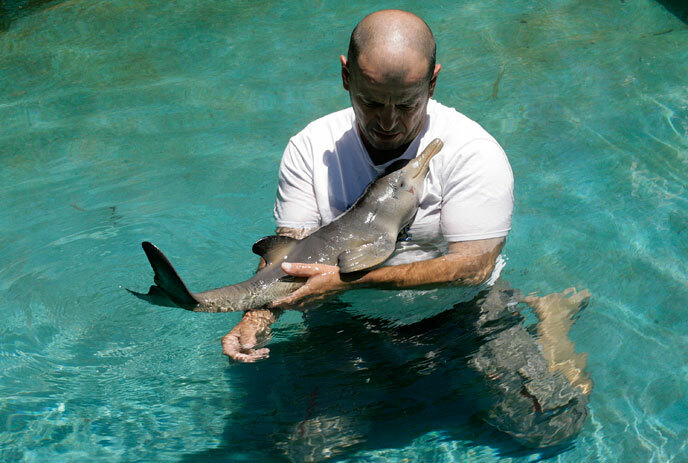 They have dedicated hundreds of hours to rehabilitating one delicate little dolphin. 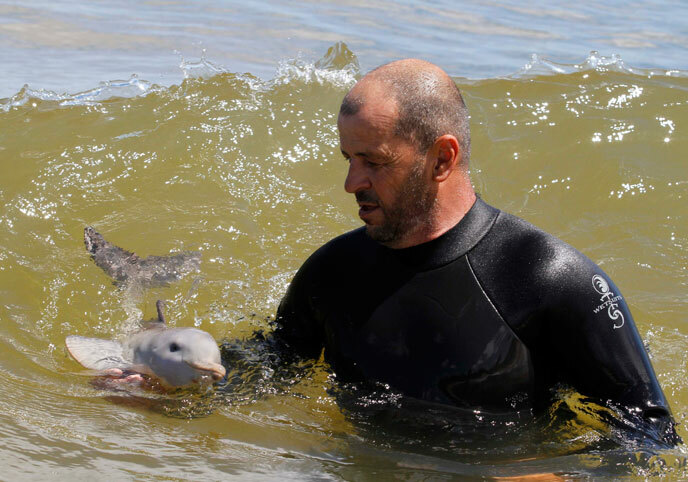 Their kindness towards one individual is a heartwarming example of human compassion for dolphins – and a sad contrast to the mass destruction of lives which takes place in Taiji.